Which is one of many, probably millions etc. Fingers, Fingernails And Hand Showing Movement In How They Are Placed In Layers Of The Dead Creatures ! Also, more info on what "white lines" mean! how they were placed in the layers! Which is a verification of the reality of what I'm explaining! 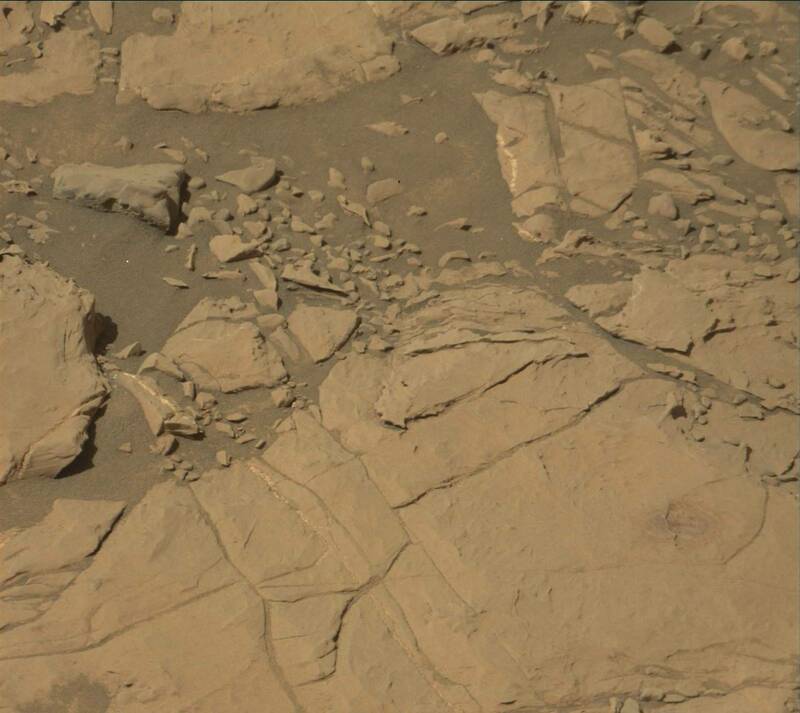 of creatures (in my opinion) to the left (follow arrows) then continues all the way to the end of the left side of the mastcam photo. Which morph's into a hand which then lifts the dead creature. Which in my opinion is a representation of millions of creatures and how they were placed in layers when the martians lost most of their creatures due to a catastrophe that ended their atmosphere and the surface of their planet destroyed forcing them to go underground or die! (In my opinion) ! Young Creatures Dying Trying To Be Saved By Odd Gesture Like Arm! A Sculptured Metaphor: Just As A Ship Dies Sinking Straight Down, So Do The Creatures That Died In The Oceans Of Mars In Extreme Antiquity ! Then partially being deflected before it hits mars ? Whenever I see a Large "regal" looking high hat! I think it represents authority, such as the authority of the object coming from space from a distant star. Or authorities on mars in extreme antiquity that help direct phobos or a similar metallic guard in space to do partial deflections etc. I've seen this hat over and over and it seems to me that it truly must have something to do with authority etc. Such as a police hat, or a queens crown, or a popes high hat, a bakers high hat being the head chef etc. Again, I've seen this high hat over and over again in similar circumstances ! Please notice how the "dropping of objects" on the flat type head makes sense! That it is a give-away in more information pertaining to objects being dropped! There is verification that that is indeed an odd looking arm doing the dropping of two sharp objects. When I just mentioned "two" sharpe objects, go to my "Startling 1" image and study how there seems to be "two" objects hitting mars as well ! Very important I think! Go to "Startling 6" and study the two major examples of "TWO" objects doing destruction! Please, please check them out and study ! I think I make a very valid point. try to understand, even if it is the simplest of terms! Notice slight motions in the odd arms, odd hand, slight gestures of odd fingers, hands etc. Notice how "white" streaks truly seem to be MOTION MARKERS". Please look for motion markers in white lines, streaks, even if the streaks is short and repeated as in "Startling 2" ! Please check them out ! I think these "Startling" images are amongst the very best Nasa has ever uploaded ! I think they truly contain a wealth of information about a few of the rudiments of the Martian sculpture language! A Crack Seems To Be Represented As Moving Wider ! Massive Creature Exodus That Seems Futile! Like lava flow, creatures try to escape, but the extreme ancient martian cataclysm will not let them! Breaking the martian's hearts, so they erect millions of memorials in great tribute to their so well beloved creatures! Memorials done in a type of diorama form, with almost canvas like qualities as a foundation, utilizing three dimensional forms, wether it be individual figurines or thousands of bump-like sections. All seemingly done in great remembrance of a planet that long, long ago, once had untold amounts of creatures both gigantic, large and small! "White" as an aid to show motion in story sculptures ! But the helper seems stuck ! Texture To Indicate Speed Of Type Of Animal Or Creature It Is! Sliding To Their Deaths On A Massive Scale ! the dead sea creatures etc. are very sacred to them! Arms Holding Something Very Dear ! Food? Or Precious Creatures etc ? Or both? seem to have memorials dedicated to how their planet was destroyed in extreme ancient times! A Video Example Of Why "White Lines" Are So Important To Many Martian Sculptures ! Amazing Story Develops At Right Side Of Image! Please notice the representation of the action that I number 1-7 ! at the right side! Many creatures leave their homes to wander then die by the billions! cataclysm, when Mars lost it's atmosphere and the entire surface of Mars destroyed. sculptures point to this. Ernest Norman's account verifies this. And all the green sculptures verifies this because GREEN is NOT account ! Plus, so much more! Channel of the dead that are smaller amongst the larger dead creatures! A Great Example Of How "White" Displays Movement! ​planet in extreme ancient times! Please ZOOM in for clarity of text and photo! to the surface of Mars in extreme ancient times! eye lid in the image below. In my estimation ! more three dimensional sculptures. Please try to recognize the subtlety in their amazing art work! Of course there are multiple meanings with much more information, because the Martians are full of elaborate detail that could take years to understand! Again, they are extremely detailed, make no mistake about that! Notice the Mastcam and the Nav-cam image or the same but the Nav-cam is "black and white" ! Bull-Like Animal Represented As Destroying Mars? Morphing Into Other Bull Like Animals? Dropping down destruction upon Mars! ​Please notice how bull like animals (the largest one) has it's back cut off straight. To me, this could very well mean it is coming down from heaving doing great destruction! the Martians, which they certainly do not want! The Act Of Strong Stabbing, Alligator Involved, Layers, Trying To Hold And Not Being Able To Hold ! Black Eyes Repeated! Please notice from Ernest Norman's book: "The Truth About Mars" , that "reptiles" seemed to have survived the cataclysm that ended the Martian atmosphere! the great cataclysm hit in Martians's ancient times. How "reptiles" seemed to have survived! And when Martians had to go underground, so did the reptiles such as alligators etc. When you get lethal reptiles such as "alligators" digging underground to survive, and you have Martians living underground to survive. When the great Mars quakes shook mars as it states in Ernest's book, when the deadly solar flare hit as sculptures indicated (Startling 1 image)! You have a real problem of "alligators" getting into and falling into living spaces underground, where Martians live even until this day 2016, April 9th ! But these events seemed to have happened in extreme antiquity, recorded by Martian posterity and sacred Martian sculptures brought into memorial sections where Curiosity Rover is shooting digital photos at memorial sacred grounds ! Alligators, crocodiles etc. MUST of reaped havoc during those dangerous days after the great cataclysms destroyed the surface of Mars and ended it's atmosphere in extreme antiquity! Martian Land In Ancient Times Being Eaten By Catastrophe That Ended Their Atmosphere! forever. Then forcing in my opinion, the Martians to go underground to survive! Land Being Swept Away ! The background image (Startling 7) is backed up and verified by the primary image. Please notice how they both have the same theme of "land being swept away" ! I darkened and sharpened the primary image for a clearer understanding of what I'm saying! Can you the viewer start to understand what GREAT artist the Martians are? The INCREDIBLE thing is, is they tell STORIES In their amazing art ! And the tip-off is that all the images that I've seen for such a long time now, that Curiosity has taken, are all geared towards how their planet was destroyed, such a long, long time ago! Which to me, Curiosity MUST be in MEMORIAL areas. They must be ! Nasa MUST of been allowed to be there ! What country or planet would allow a space rover from another planet to go trouncing on their sacred grounds? HELLO ! And who would feel right about doing that without their consent? get the best images of their STORY Sculptures. They MUST of known full well the Martians had incredible stories to tell ! Plus, build it with the LONG arm of Curiosity, to be able not to destroy things that they shouldn't touch! And I will go as far to say in 1964 on April 24th, the heads of Nasa had a meeting with the Martians! Or close to that time. That is also around the time when they took the first orbiter photos (Mariner 4). And that is why I think the tie-in with "Lonnie Zamora and Gary Wilcox" is so important. Please read about them in my "Martian" section! I think the meeting with the Martians were at Holloman AFB! Please read about that as well. Linda Moulton Howe has hints about it, but I don't think she gets the hints yet. She is such a great lady, I think she will in time ! She is so very smart! ​If Nasa did "doctor" these images below, they have really great artists! have problems with the elements in Martian nature! have to go outside for very long! Just installed in sections! So that is why I'm "on the fence" about these wonderful sculptures. If Nasa did do this, I have to give them praise. But when that artist sleeps at night, he might get a little visit from his little birdie :) He may not be so free as he thinks. Even if he receives a nice little pay check! This one seems to have been doctored by Nasa! If Nasa's Curiosity "Wheel" is in the photo, is that a tip - off that they have doctored the image? and More Motion Occurs ! Multiple Arms Gathering And Throwing ! etc. But in this case, it truly seems like an odd face and body are throwing down strange debris. But what I see time and time again, is the use of multiple arms, not just two per body. But seemingly many, many more arms and hands per body! Such as in Ancient Hindu art.